The final Pre-Alpha for Village Monsters, v0.5, is out now! Rad! It's been 6 months since I started Village Monsters, and this latest demo - code named Strawberry Thunder - represents the final Pre-Alpha version I'm releasing. The next demo you play will be the first official Alpha release! Pre-Alpha means that the game lacks core gameplay loops, has placeholders, incomplete features, bugs, and is overall pretty rough. However, out of all the releases I've put out this is by far the most polished, content-filled, and interesting - or, at least, I hope so! If you like playing early games then please take a look! If you're still on the fence about a game so early in development, then why not follow along on this site, Twitter (@WarpDogsVG), or my main site, www.warpdogs.com! 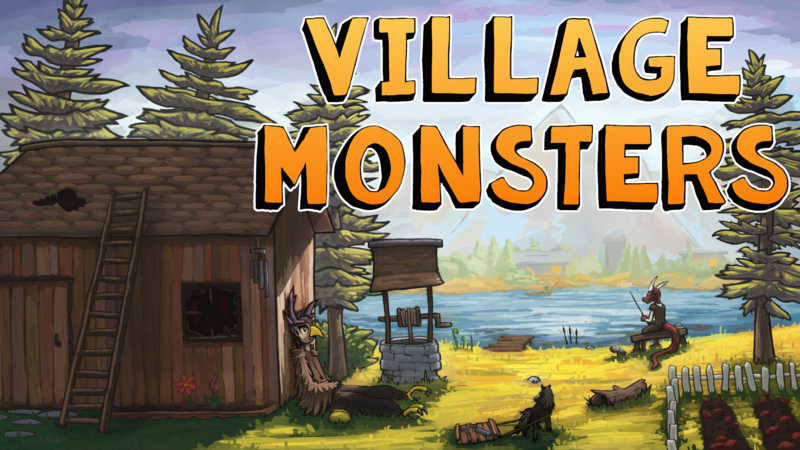 Escape to a carefree and colorful village where the monsters are your friends. Release: Village Monsters Beta 3.2 (Pumpkin Pie) is now available! Release: Village Monsters Beta 3 (Pumpkin Pie) is now available! Release: Final Update for Summer Sherbert Demo is now available! Release: Update 2 for Summer Sherbert Demo is now available! Release: Summer Sherbert Demo is now available!